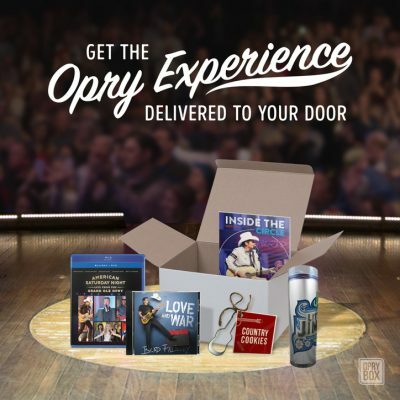 The Grand Ole Opry is introducing country music fans to a new subscription box, the first of its kind to be curated around country living, Nashville, and the Opry. Each season, the Opry Box promises country music surprises including themed one-of-a-kind merchandise, an exclusive Inside The Circle magazine, and more. The Opry Box launches with “Opry Friends”, a box celebrating friendships between Opry artists as well as between country stars and their fans. Opry member Brad Paisley graces the cover of the seasonal magazine, sharing the stories about friends who contributed to his upcoming album LOVE AND WAR, also included in the first edition Box. Paisley’s Opry fishing buddy Little Jimmy Dickens is remembered in the Box with the inclusion of a travel mug emblazoned with the Country Music Hall of Famer’s name as found on his Opry House dressing room door. In addition to Box surprises, the inaugural Box also includes the Grammy®-nominated DVD/Blu-ray American Saturday Night: Live From The Grand Ole Opry featuring Paisley, Blake Shelton, Darius Rucker, Brett Eldredge, and The Band Perry. Single boxes ($40 plus shipping) and subscriptions for four seasonal boxes ($140 plus shipping) are available now at opry.com and at 1-800-SEE-OPRY. Country Music News Blog participates in advertising programs that help fund the operation of this site. For more information please visit our privacy statement. This entry was posted in Brad Paisley, Nashville, Press Releases by Shauna "WhiskeyChick" Castorena. Bookmark the permalink.